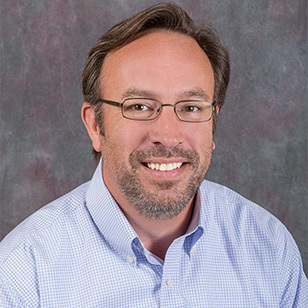 "As a Closet Works Design Consultant I am dedicated to providing an exceptional experience for every client I have partnered with! I strive to find solutions that are unique, have balance, and will simply 'simplify' your life. Each client has a different set of challenges. I believe that the best part of my job is listening to what a client is hoping to achieve, finding the best solution for their issues, and making I become a reality. I approach every project by looking for the possibilities rather than looking for the obstacles. I must say that the greatest compliment from any client is the 'big smile' on their face after their personalized Closet Works creation is completed!" Meant to be Seen Day or Night! Loaded with goodies, this closet goes beyond simple organization. The beautiful design, in combination with carefully selected closet accessories, store the owners posessions while creating a bold statement akin to art. 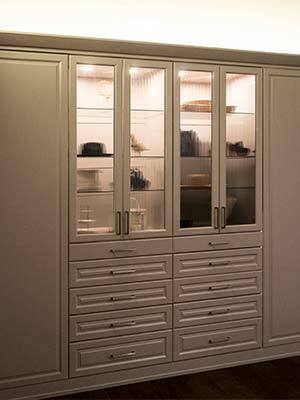 At night, the effect is further enhanced, as this closet includes an LED system that displays the unit in a glowing light show. 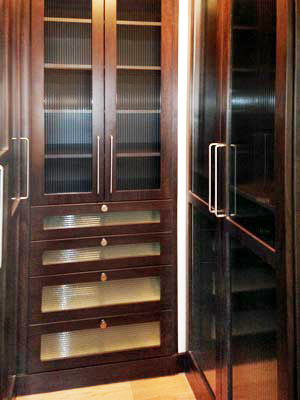 High Style Wardrobe Closet System Becomes a Work of Art! 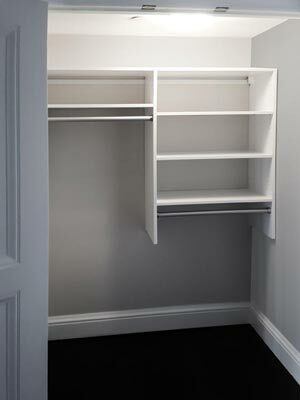 Many homes do not include sufficient closet space to suit modern needs. 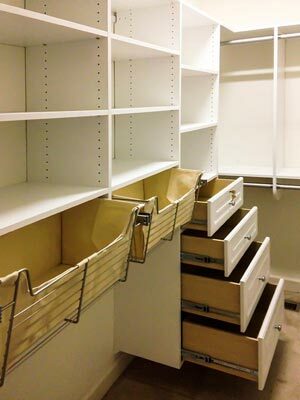 One way to increase storage capacity is to install an "outside the closet" closet organization system. 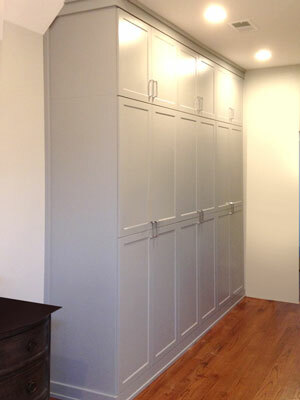 This wardrobe closet is constructed from MDF and painted with a custom gloss color. 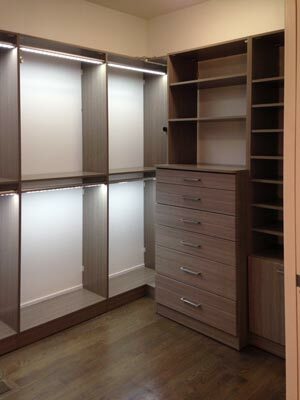 Often refered to as a wardrobe, these types of closets are intended to be visible rather than hidden behind closed doors. Being able to paint the system adds an additional level of customization to the project and allows it to further blend seemlessly into the rest of the home's decor. 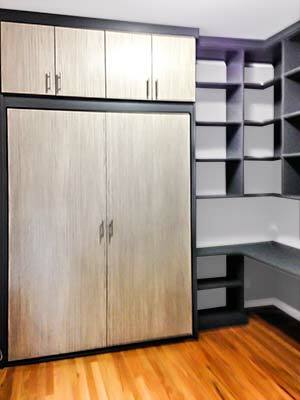 Loaded with custom closet accessories, this closet is not only beautiful, but highly functional as well. 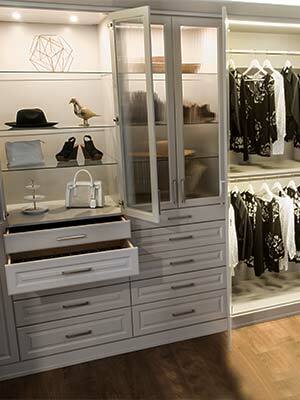 Pull-out laundry bins are concealed behind sliding doors on the wardrobe/wall unit system. 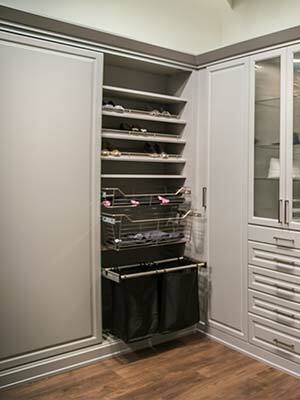 Pull-out wire baskets and slanted shoe shelves add additional concealed storage that make this closet the perfect solution when the storage must be on display out in the open. 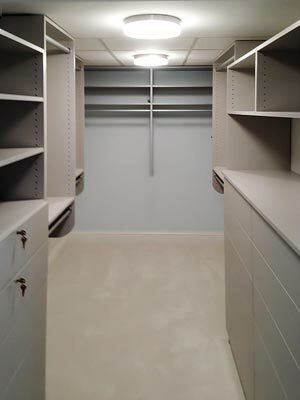 Custom closet organizers truly increase the functionality of any closet design, allowing the unit to hold more while increasing the owners ability to find whatever is need on a moments notice. 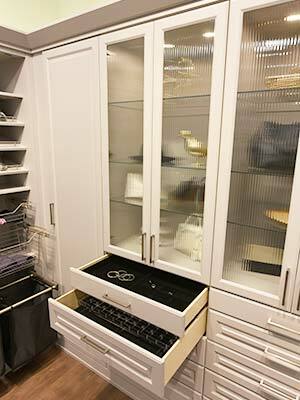 This closet includes drawer inserts for jewelry organizers and also lingerie drawer inserts. 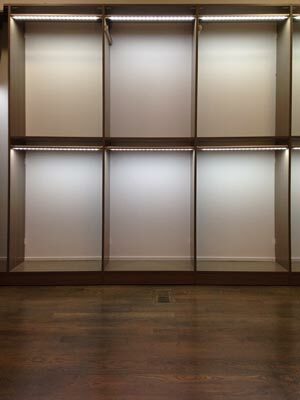 Illuminated under glowing LED lights, this custom closet not only makes a wardrobe more readily available, but it turns the wall into a showcase. This design is comprised of organizational essentials including a drawer system below a set of shelves, and a special section to put shoes on display. The area is spacious as the unit wraps around the corner and allows utmost easy access. This LED-lit unit is a contemporary and artistic display that is not only visually appealing, but is commodious for a great deal of storage. The custom straight-forward layout makes organization easily manageable for hanging a wide array of clothing while beautifully doing so. Convenient and compact, this design is the perfect solution to maximizing organization in a seemingly tight space. There is plenty of storage capability by involving an ideal amount of shelves, multiple hanging rods, and even a pull-out tie rack. In a sleek black laminate, this unit is stylish as it contrasts tastefully against the light wall. Customized to accommodate all-in-one organizational needs, this design combines everything from shelves, wide drawers, hanging rods, and pull out baskets lined in fabric that are excellent to be used as hampers. The unit efficiently conserves space as it wraps around the corner of the wall. The soft white laminate is comforting and brings warmth to the room. 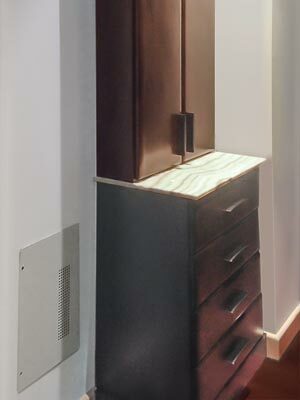 Designed to wonderfully compliment a sloped ceiling, this custom organization system is dynamic yet fulsomely balanced. 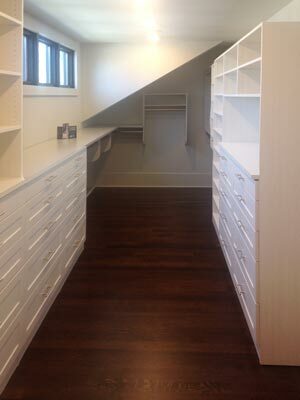 Aligning both sides of the walls, there are a generous amount of drawers and shelves along with a lengthy countertop. The spacious walkway leads to an exclusive area for hanging clothes. As the daylight reflects upon the light laminate, the space opens up and creates a relaxing atmosphere. This design is flourishing with room to organize down to the details. 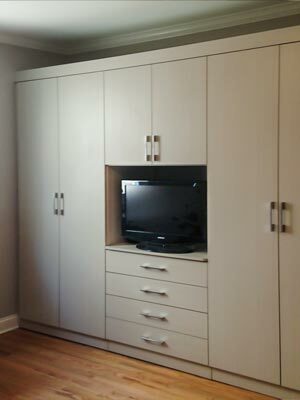 Custom built to accommodate a number of wardrobe necessities, the unit is spacious and jam-packed with storage capacity. With hanging rods, drawers, shelves, counterspace, cabinets and an area raised on a platform for a collection of shoes, no element for organization is omitted. There is also a convenient pull-out basket hidden within a shelving arrangement. In this second view, there is clear-cut access to a hanging rod organizational system. 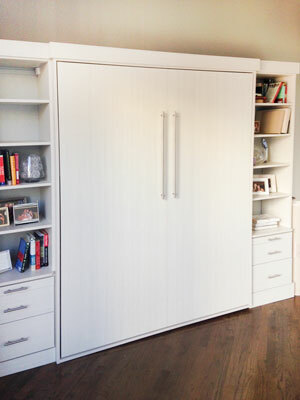 This custom closet offers a variety of storage spaces that are welcoming to a myriad of items. Clothes, shoes, and accessories all have their own comfortable and rightful places for safekeeping in this unit. Simple and easy as pie, this layout is arranged for absolutely painless organization. Complete with double hanging rods, shelves for folded clothes, and also a convenient overhead space for additional storage, this unit is just the right amount of space for a modest amount of belongings. 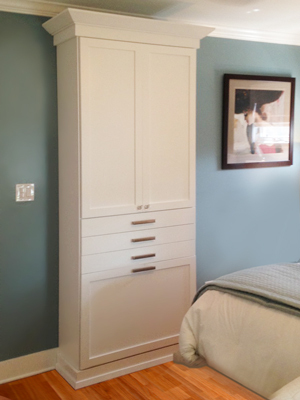 This wardrobe style closet is a beautiful addition to a master bedroom. As it stands elegantly with its airy and white laminate and Aztec Chrome handles, it fufills various organizational wishes. The elongated cabinets conceal a hanging rod suitable for a conservative amount of clothes. The three drawers can store smaller items such as undergarments and socks. Lastly, the larger drawer is actually a convenient tilt hamper. This peculiar design has a lavish and upscale presence. 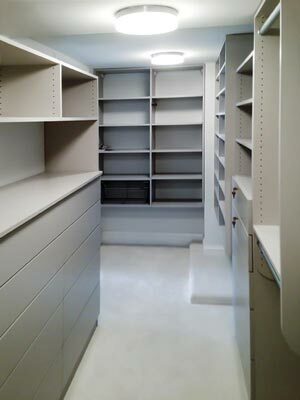 Each section of this unit provides an abundance of shelves and custom-sized drawers for proper organization. The arrangement is conveniently built into its own nook which is perfect for space conservation. With its lustrous glass window cabinets and lush cocoa laminate, this piece is a show-stopper. Fitting neatly and tightly in the corner, this design is an appropriate size for organizing various items that need a place to call home. Drawers are provided that can hold remotes and cords, kitchen items such as special silverware and napkins, and any other miscellaneous items. The clean and straight-to-the-point cabinet can be used for storing extra glassware or medications. With its rich chocolate laminate, this unit adds a touch of elegance to the room. Spanning the wall, this design is not shy in its purpose for maximum organization. 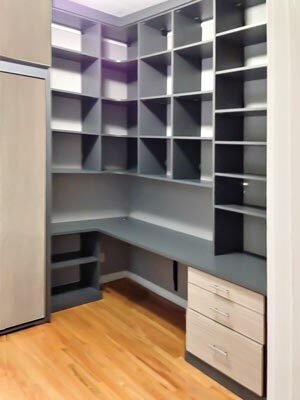 Large-scale cabinets and multiple drawers offer incredible storage capability and numerous items can be concealed that would otherwise look cluttered. 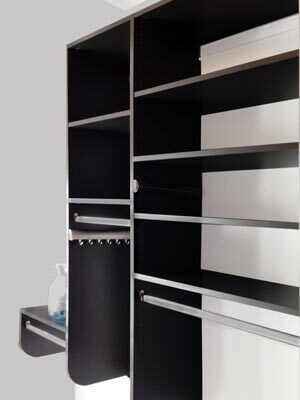 The unit enables the room to look immaculate and put-together by accommodating such a great deal of storage. There is also a place to fit a moderately sized television suitable for a bedroom, guest room, or office. This design is a beautifully arranged grid illuminated under a unique and modern light fixture. 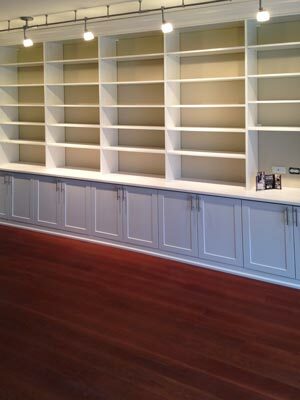 The vast wall-length unit is the ultimate organization system for entire collections of books, movies, photographs, fragile figurines, or treasured artwork. Cabinets below can be used to hide away items that could cause an eyesore in this bright and voluminous room. This expansive design in its soft and cool gray Rain Cloud laminate spans the wall offering an absolute abundance of storage potential. The floor-to-ceiling cabinets can hold an endless amount of things and will ensure a clutter-free home. The unit adapts perfectly to the wall leaving as much space as possible in the room. Laundry rooms can be tightly packed areas of the house and organization can be difficult without a well-designed system. In this arrangement, the washer and dryer are fit like a glove below a spacious countertop. 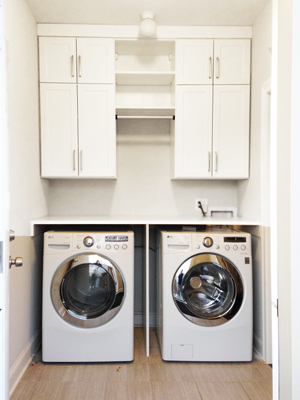 The elevated cabinets offer excellent storage places for laundry necessities such as detergent, fabric softener, and also cleaning products. This thoughtful design intentionally provides safety by keeping chemicals out of reach from small children and pets. In the center there is a convenient hanging rod useful for separating delicate garments from items usually folded. Do you have limited space, but need both a guest bedroom that can accommodate family or friends during the holidays, plus a home office or living space for yourself the rest of the year? Both of these needs can be satisfied with a single room when a wall bed is designed into the solution. Perfect as a comfortable home office most of the year, The murphy type wall bed can be opened up when company arrives, creating a private bedroom for guests. The system was designed in "Moonlight," a neutral gray finish, but employs "Carnaval" as an accent on door and drawer fronts, creating a light, bright, airy feeling to the space. This Murphy style wall bed is in the fully closed position, allowing the space to be used as a highly functional home office. When overnight guests arrive, it's a simple matter to pull down the bed, converting the space to a prive bedroom that guests will love. This Murphy style wall bed in its show-stopping Diva laminate is a wonderful addition to any guest room as it provides comfort and convenience all in a modish design. This unit functions on many levels — When folded down, it offers bedside table space to charge a cell phone or place a glass of water (not next to each other, of course!). When folded up, the design becomes a wall unit for books, photographs, and various decor. The elongated handles are a contemporary touch to this unique design.